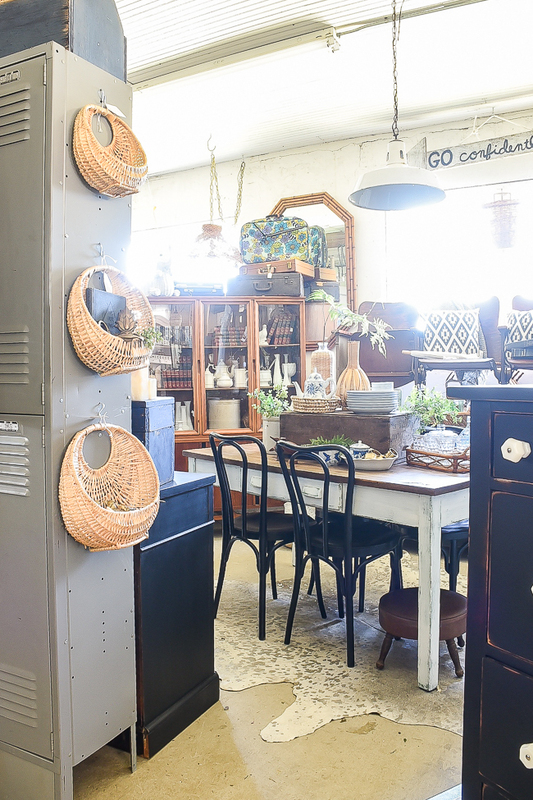 Unique vintage decor and hand painted furniture featured at Sweet Clover Barn. 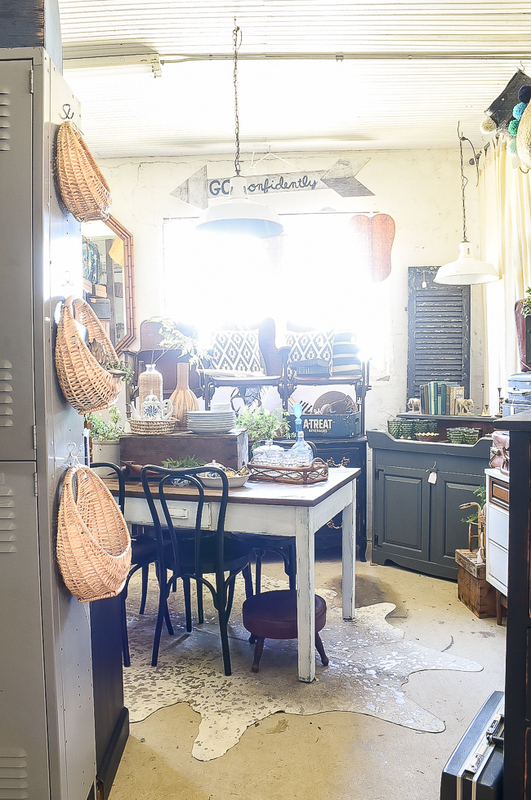 Before I get to the preview of our space for the July Sweet Clover sale, I want to thank you for the incredibly sweet e-mails and comments regarding the Better Homes and Gardens Feature. Your genuine excitement and kind words mean more than you know and I can't thank you all enough for your support. 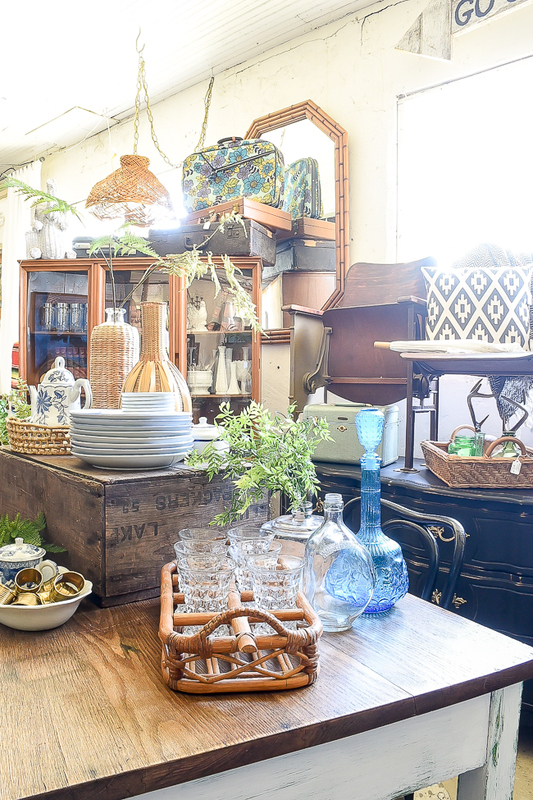 It's time to share our space for the July Sweet Clover sale! 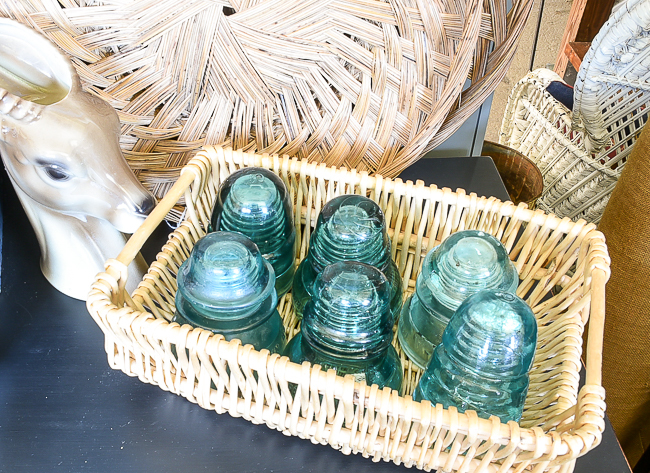 Cassie and I cleared out the red from last month's sale and brought in more black, wicker and our favorite cool tones. 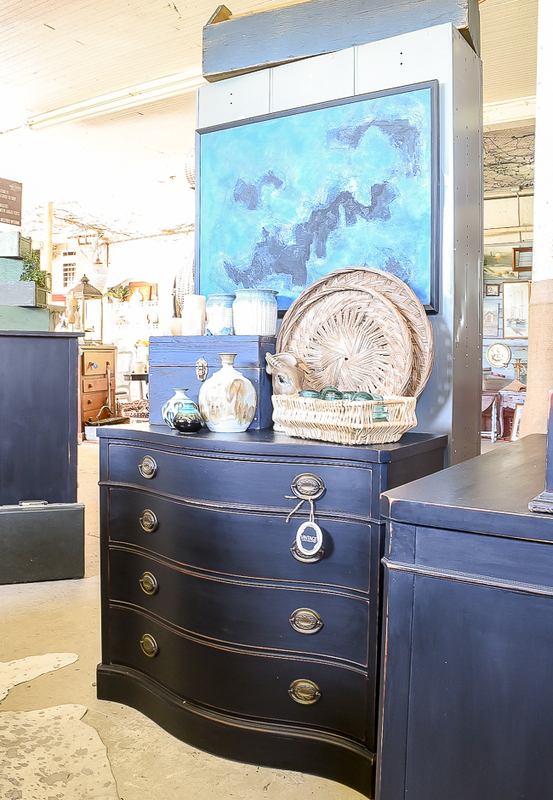 We sold a lot of our large furniture pieces, so this month also brings fresh new custom painted furniture. 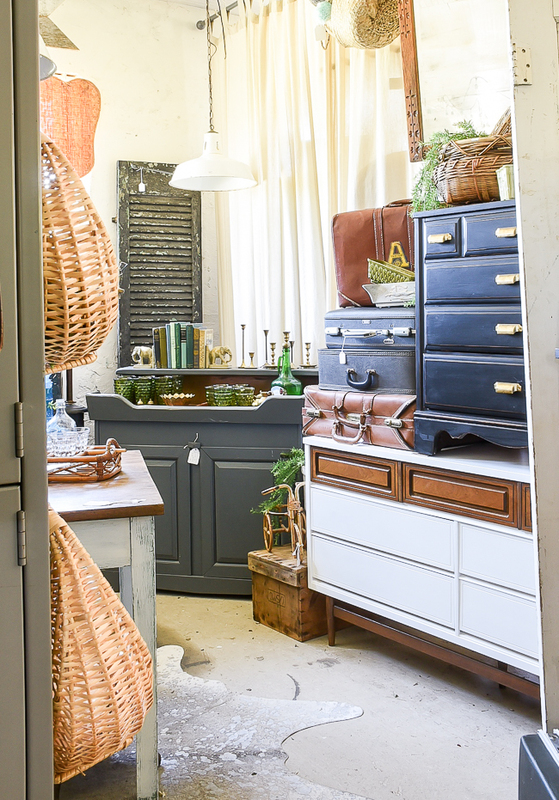 Cassie previously had this beautiful antique dresser in the barn, but it didn't sell in its natural wood state. 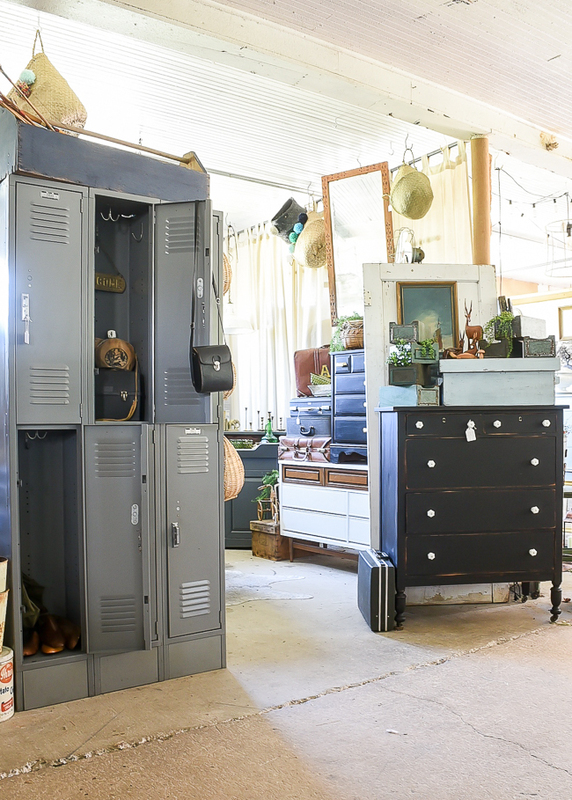 She brought it home, gave it a makeover and now it's back and ready for a new home! 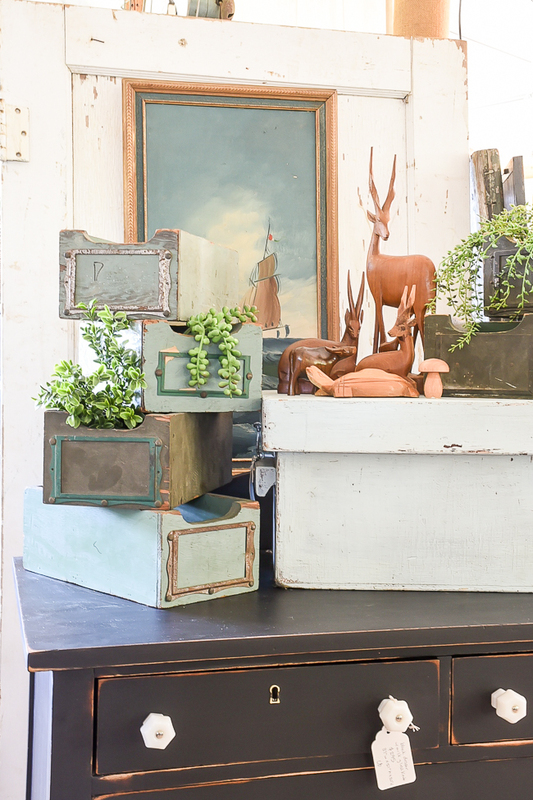 On top of the dresser are a bunch of vintage green boxes that I found a couple of months ago. I had a few listed in my ETSY shop and they sold quick, so I'm hoping these sell too. 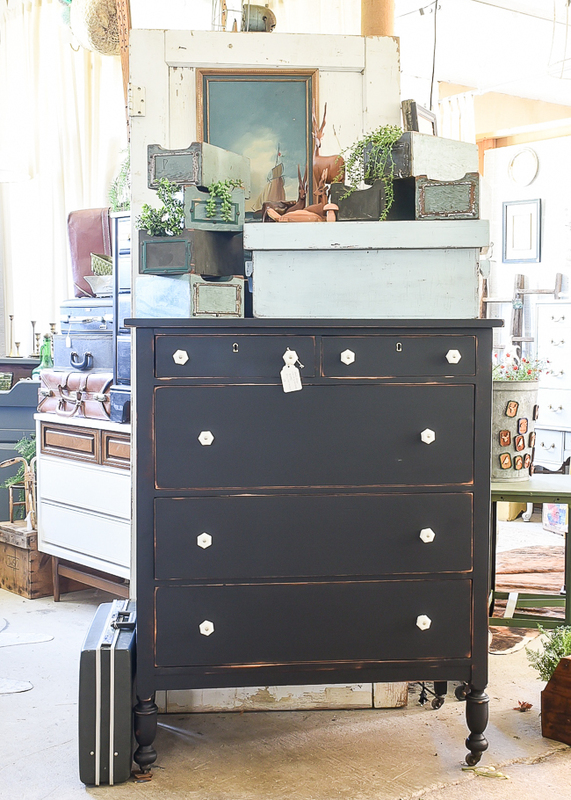 The little black dresser I shared the other day is stacked on top the MCM Bassett dresser, which is one of my favorite pieces. I REALLY wanted to keep it, but I just didn't have a place for it in my home. Over in the corner is a dark gray dry sink that Cassie picked up that has a beautiful copper lining. 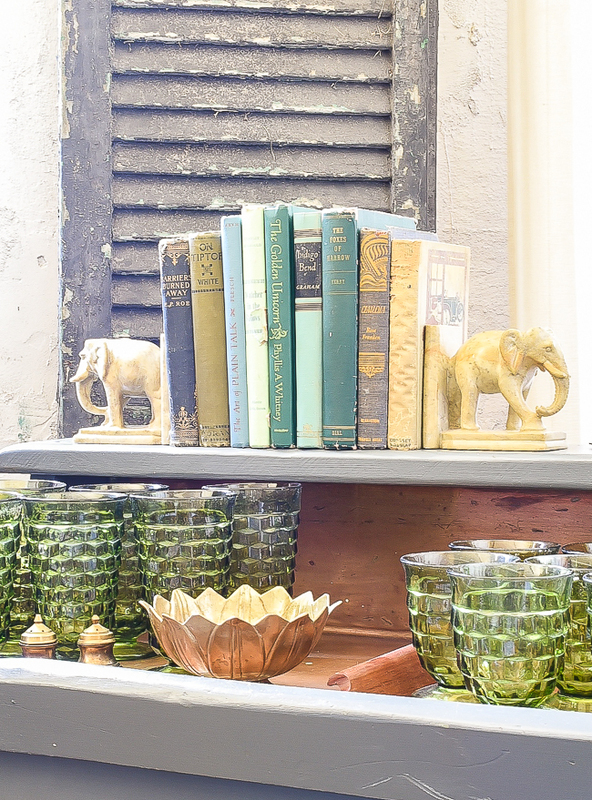 We filled it with lots or brass and green vintage decor, including brass candlesticks, gorgeous green glass and a variety of green books. 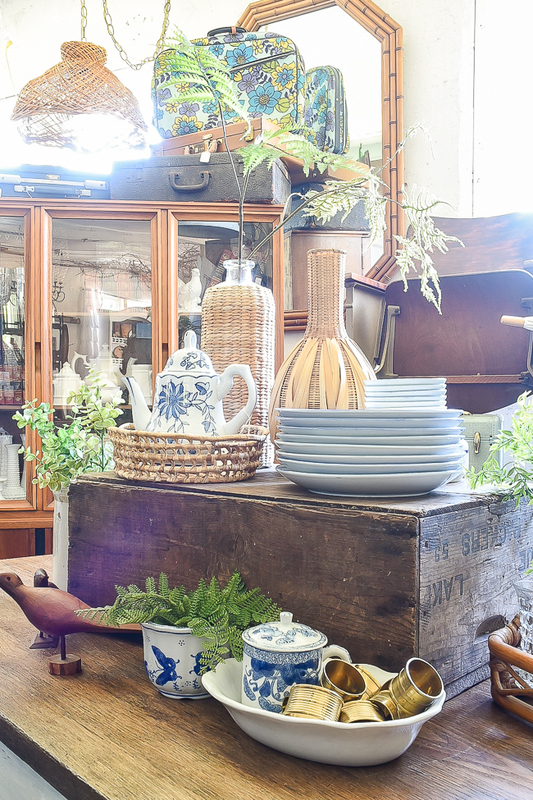 We displayed Cassie's fish plates and lots of pretty blue and white pottery on the center of the table, which is also accented with more wood and wicker. You guys know I LOVE my vintage theatre chairs, so I jumped at the chance when I had the opportunity to buy similar ones. 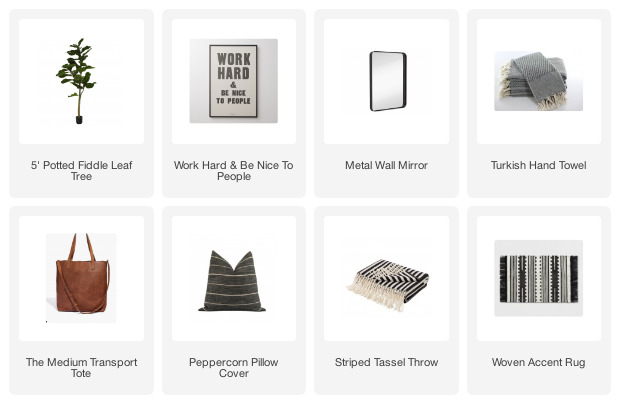 I styled them just how I would at my own home with a black and white throw, pillows and books. They are sitting on top a beautiful French dresser that Cassie brought in this month. 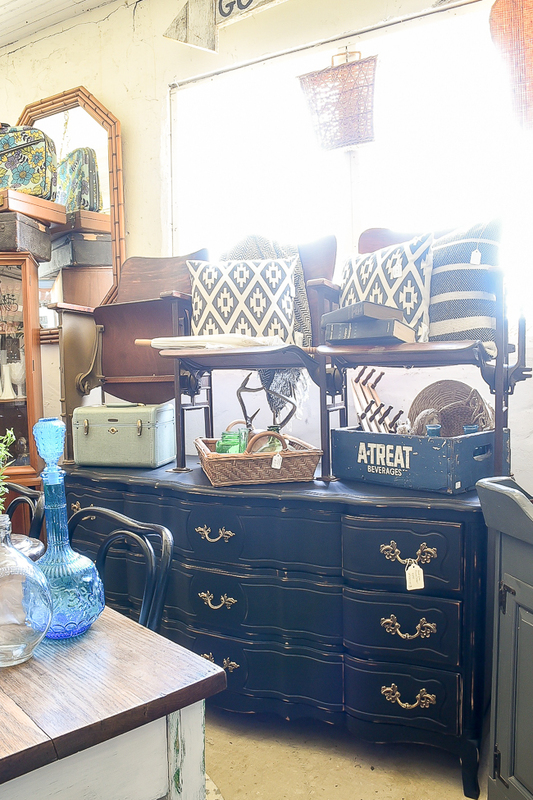 On the other side of our space sits my small Drexel buffet and more blue and wicker accents. 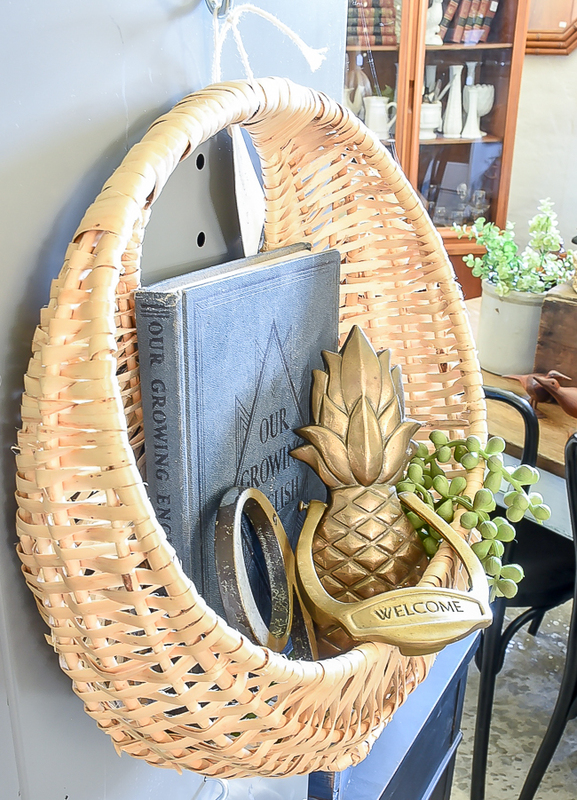 I love using flat weave wicker baskets to decorate the walls in my office, so I brought a set of three to the booth this month. 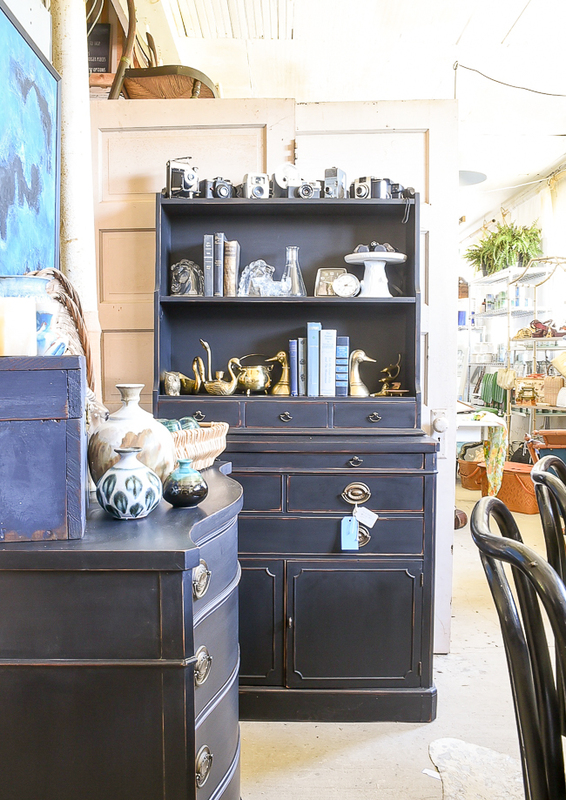 Next to my buffet is Cassie's black hutch where we displayed my collection of vintage cameras as well as old books, clocks, and brass. 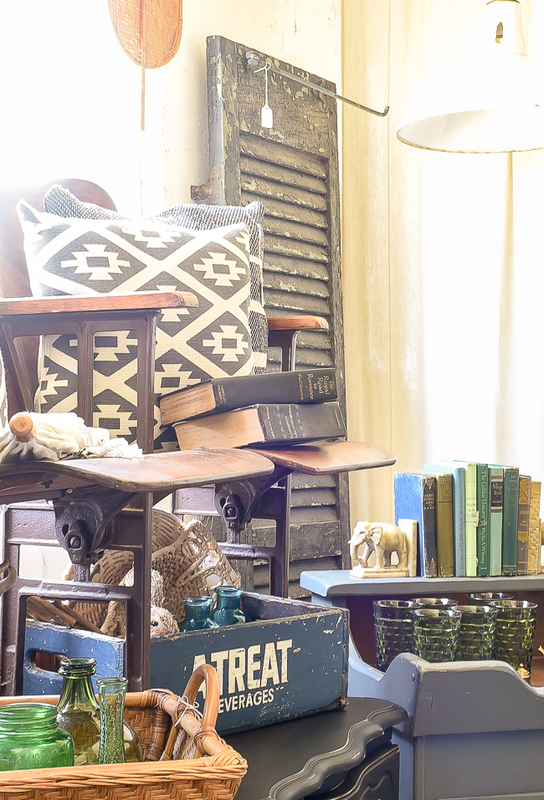 I love the cool tones and decor that we brought into the booth this month and hope you enjoy them too!